By now, you have probably come across so many following-your-passion articles claiming if you just do this thing or that thing, you will finally be happy, that you want to throw your phone against the wall. And then you come across contradicting articles like “Do everything BUT Follow Your passion,” commanding you should be letting your skillset lead the way, not your heart. What in the cahoots? Who should we be listening to here? The answer may be listening to the Japanese. 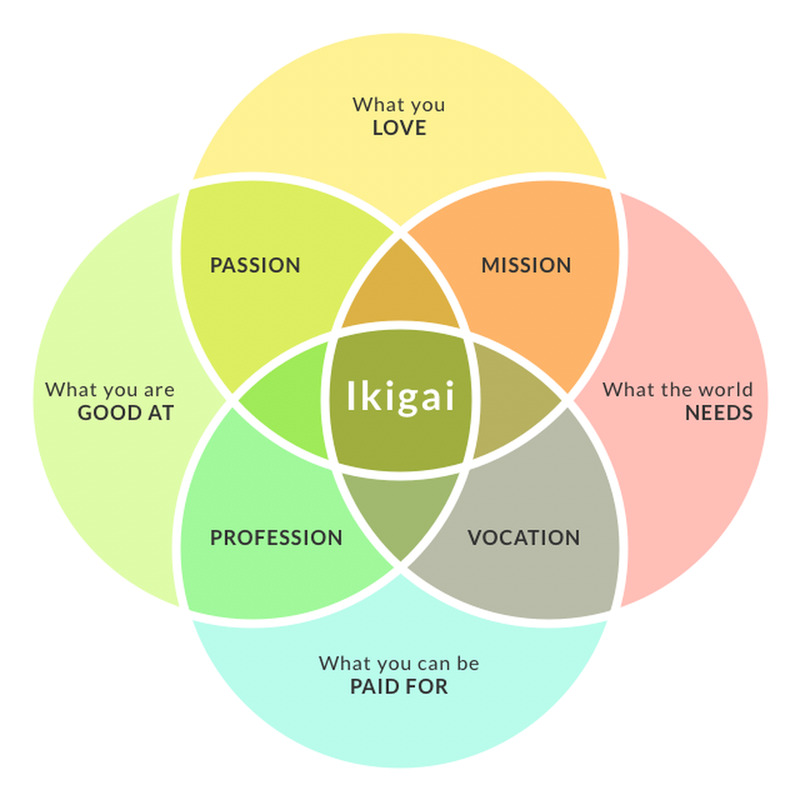 Their idea of finding your life’s purpose isn’t contrived from a marketing ploy, it doesn’t involve the use of buzzwords for the sake of being trendy, and it isn’t part of some media scheme to get consumers thinking a certain way for political reasons — Their idea of finding your life’s purpose is a little something called Ikigai. Your ikigai (pronounced “Eee-Kig-ee”) is your reasoning for jumping out of bed in the morning — a reason to revel in and appreciate life every day through what you love doing and that which brings joy to others. Remember, this isn’t a quest to figure out what career you should be in or what path you should take to find your zen in life. This is to figure out your life purpose in its entirety — Integrating your professional world into your personal world, reaping the financial benefits of your skillsets as well as the reward of soul-filling abundance from contributing to the greater good, feeling like you are put on this Earth for a reason. What do I love? I love writing to evoke emotion — whether that emotion is laughter, sadness, anger or hope, I want people to feel like they aren’t alone in their life struggles. What am I good at? I’m good at storytelling, giving advice and being real and relatable to both strangers and friends, online and offline. What can I be paid for? I can profit from writing anything — articles, books or anything else that revolves around content creation. (The problem I’m having with this one is that I feel like I have so much more to offer, but I don’t know how to get to the next level and feel fulfilled at the same time). What does the world need? The world (again, according to me and my ikigai search) needs truth, openness and love. It needs less competition and jealousy and more collaboration and sincerity. Another important concept of ikigai is that it is not meant to be pursued alone. This is not meant to be a gloating “I have conquered my ikigai quest! My work is now complete!” No. We need to speak to people with similar passions and interests so we can better understand how to make the world a better place. Also, we cannot expect to find our ikigai overnight or even over a couple of weeks, months or years. This an understanding of your own, unique life mission here. Enjoy the process getting through it. The more determined you are to find your ikigai, the faster it will be delivered. Let me know when you find your ikigai!